Madonna is to Instagram what Cher is to Twitter — the undisputed Queen of the app with a penchant for highly confusing (but clearly iconic) posts. The “Champagne Rosé” vocalist has also been known to spill a little tea about her much-anticipated 14th LP. For starters, she has all but confirmed that the title is Magic through her constant use of the hashtag and frequently gives glimpses into the recording process, such as her recent studio session with Colombian superstar Maluma. The pop icon now has fans scratching their heads with a series of posts dotted with the apple emoji. 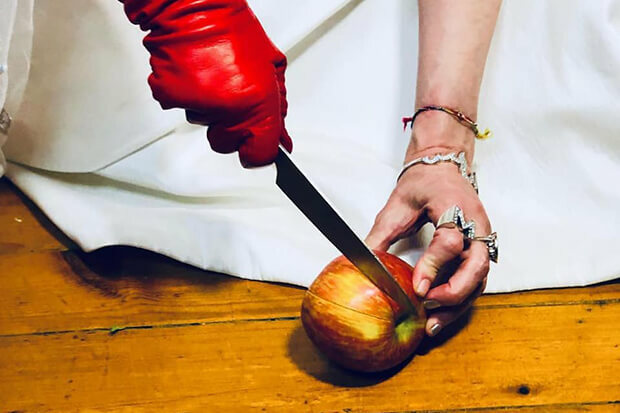 Madonna even posted a picture slicing an apple while wearing one red, rubber glove on one hand and the “M” ring from her “Sorry” video on the other. Could the title of her lead single have something to do with the delicious fruit? Has the Queen of Pop just taken up baking? What is going on? One thing is for certain, thing era is going to be full of surprises. (Oh and it looks like the brunette hair is back for good). Try to decipher Madonna’s mysterious promo below. What is going on? Let us know below, or by hitting us up on Facebook and Twitter!